Did you know that the shape of your trees alters the perception of your house? Professionals make it their business to know what will compliment your house, and what will make it look bigger, smaller or more angular. They know curb appeal! Not to mention they know how plants grow, where they grow/thrive best, which ones are best for allergy sufferers, you name it! Don’t have a big budget? You can hire someone to come up with a landscape design and then you can execute it yourself in stages. Does the cost intimidate you? After you gather all the facts, you might realize it’s not what you thought. Landscapers have proper vehicles for carrying the needed supplies, they have all top of the line equipment that will give you a top of the line yard and they have the licences needed to operate and tow some of that heavier equipment. Sometimes it makes more financial sense to let a professional take over, rather than buying or renting equipment yourself. Most landscaping companies offer a free quote and have promotions and packages. Are you struggling with time? Most people can agree that they wish they had more time in a day. According to statistics Canada, majority of couple households are dual-earning. With two people working, this means less time for daily chores inside the house, even less time for maintaining the outside of the house, and virtually no personal time. 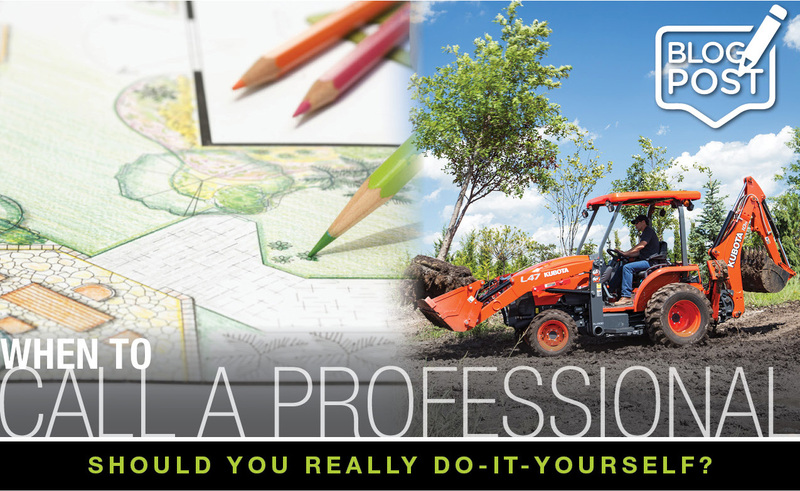 So ask yourself, “what is my time worth?” Whether you’re conquering a large landscape project, or just need help with weekly maintenance, calling in a professional can give you a beautiful yard and earn you some personal time. Is maintaining your property too much for you physically? Physically, maintaining the outside of your home is a lot of work. Sometimes our bodies just can’t handle it and sometimes our bodies can, but we don’t want to. Landscapers can complete those big demanding jobs to save your back but they don’t only take care of the large jobs, they also take of general maintenance; cutting grass, pruning shrubs/hedges, maintaining garden beds, shoveling snow, salting pathways, etc. Is there a chance you might do the job, but have to pay a professional to re-do it? Some jobs are just too big or risky. If you’re doing something like taking down a large tree, spraying your lawn for weeds, tackling a complete garden redesign, or doing some hardscape work like a new patio, it’s probably best you leave it to a professional that will do it right the first time and will warranty their work. Remember, sometimes the costs you don’t see initially, outweigh the ones you do. It’s worth hiring a professional so you don’t end up with a DIY fail, or an injury from pushing yourself too hard physically. Get some of that precious personal time back by taking a load of your shoulders and trusting an expert. Don’t forget to ask your pro if they purchase and service their equipment at Kooy Brothers...that will ensure they’re using the right tools for the job! Best wishes!